The new converter slide gate type CG is a highly effective solution for reducing slag carry-over in converter steelmaking plants. Its development is the result of many years of engineering and operational experience in close cooperation with the steelmaking industry. With our slide gate technology for converters we support your goal for ultra clean steel production with economical benefits, superior reliability and top safety standards for operation and preparation. The Interstop ladle slide gate system have a high-end technical standard. Different sizes of the Gates deal with any application case. Maximum throughput with full ladle for an optimal quick start of casting. Optimal throughput with almost empty ladle to maintain the required casting performance. Metallurgical periphery conditions may have an influence on the selected casting diameter. Our solutions for tundish slide gates enable optimal utilization of the tundish and help to maintain the quality of the produced steel during the casting operation. Both electrical and hydraulic actuated stopper drives are available. These compact drives are designed for high performance and accuracy. The Stopper Rod Mechanism has very limited mechanical play offering precise reaction, minimal maintenance and long lasting components. Advanced experience for fast installation and start-up times and excellent after sales service. 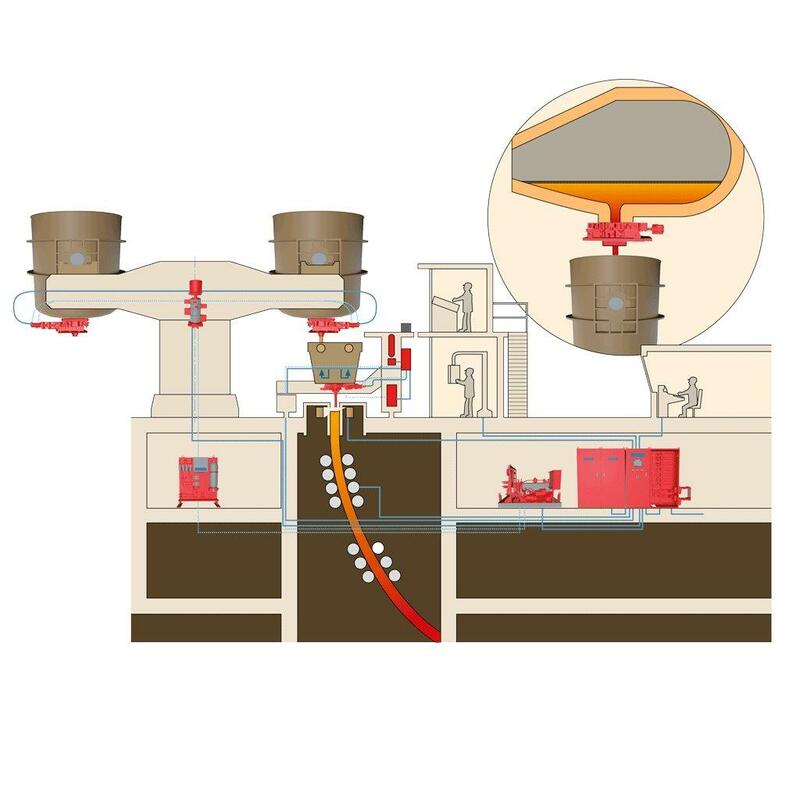 The stopper control system is an integral part of the RHI Magnesita ladle to mould technology – combining refractory and system excellence to provide best suitable solutions for clean steel production. Our NFM slide gates from are simple in handling and maintenance which results from our long lasting experience in flow control. They are crafted in expected high swiss quality and precision – products with an outstanding technical standard. Your benefit of our NFM slide gates technology is improved copper quality!